We are Air Duct Cleaning Westlake Village, an established air duct cleaning business that specializes in a number of different services pertaining to vents. We deal with vents for different types of buildings, including homes, offices, and public areas. Our services include duct sanitizing, duct repair, HVAC unit repair, HVAC maintenance, and more. We strive to provide you with high quality service when it comes to dealing with any duct problem, and our way of doing this makes us a good choice. When a duct gets clogged, it is not necessarily because of so much dirt flying in; sometimes, it could be because the filtering system is damaged for some reason. Whatever affects one of these two will affect the other, and it will result in the reduced quality of air inside the building. For this reason it is a part of our policy to examine both the ducts and the filters first. This allows us to address the problem better and come up with the right solution. 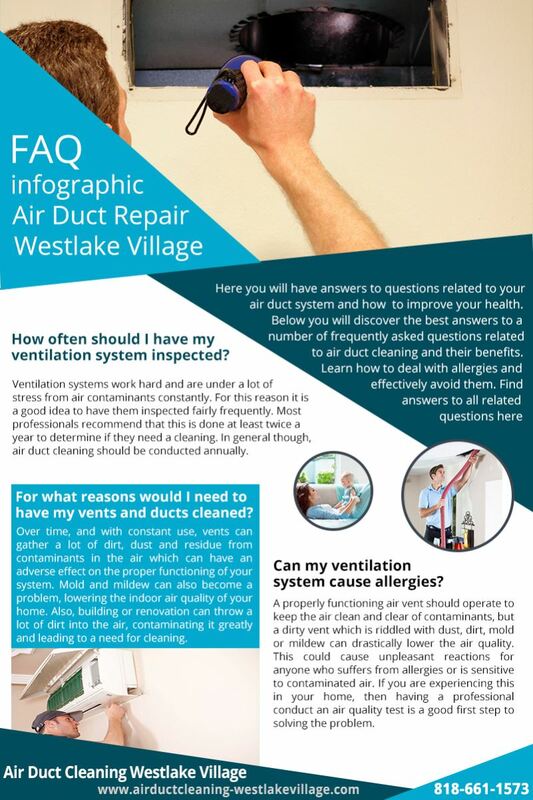 Air Duct Cleaning Westlake Village is the service you can rely on. We are available 24/7, and you can contact us either by telephone or through our online site. All you need to do is give us a call and one of our cleaning technicians will be right over. If you need help with your ducts, you can leave it to us!